Here's a free lesson in floral design basics. It's a quick guide to floral terminology and the elements of design for making a fresh or silk flower arrangement, along with a few tips on choosing an appropriate design style. This is a matter of personal preference, and it's half the fun! There are principles of design, such as balance and proportion, that are important guidelines to creating a pleasing flower arrangement. But as for selecting the elements for a floral design, the combinations are infinite and totally up to you. I like to think there are no rules that must be followed, although mixing exotics and tropicals with traditional flowers might be considered unusual by some people. So what, I say! Be as daring as you like — it's your creation! Serving as the main, or focal flowers, these are large blossoms measuring from 3 to 6 inches wide. They are the main attraction, the attention-getters in a design. A single stem can have one, two or three blossoms. 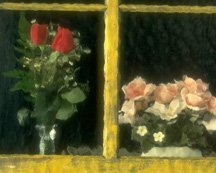 Larger blossomed items usually have longer stems. The blossom size of this group can range from 1.5 to 3 inches. A single stem can consist of two or three branched sections. Each branch can have several blossoms and perhaps a bud. The larger size can substitute as focal flowers in a medium or small arrangement. These small flowers can be used to fill in gaps and dress up appearance. They impart a delightful sprouting effect to the design. A single branched stem can have from 20 to 36 little blossoms, each measuring .25 to .5 inch or less. Special Note: Unusual, small-blossomed varieties of the Intermediate group such as Freesia can also be used as filler in large centerpieces. You might also consider using less common elements for filler or intermediate placement, such as grass, tall rushes, cattails, bamboo, berries... even feathers. All are available in colors. - Does the design need to complement a particular room decor (modern, colonial, oriental, etc.)? - Will the arrangement need to fit into a certain space (tall and narrow, or wide and low)? - Will it be placed where the back will not be seen, or will it be viewable from all sides? Answers to these questions will help you decide on the size, shape and style for the floral design. Also think about what kind of container, and container shape, would present the best effect for the flower arrangement in it's intended setting...a colored or clear vase, a low basket, a round bowl? If you haven't already done so, take a look at these popular flower arrangement styles for some ideas. Isn't it true that unusual artistic displays are the ones that get our attention? Flower arranging surely can be considered an art form. Floral crafting and design is an extension of your own creativity, and should be viewed as your own interpretation being presented for all to enjoy. Dare to create floral art in your own special way. In time, you will learn to trust and listen to your creative urgings. You will discover that the art of floral design can be an enjoyable, relaxing and challenging activity that will definitely grow on you! There, learning these floral design basics wasn't hard, was it? I hope you found this bit of floral design basics instruction to be helpful. Whether you're planning to make a fresh or silk flower arrangement, you'll never be bored with the infinite possibilities of combining some or all of these floral design elements! tips on the secret to great color schemes. 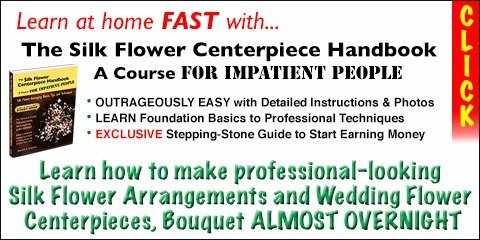 More FREE Silk Floral Design Coaching! It's FREE! Don't miss out — sign up now!